Holidaymakers are set to spend 50 per cent more time using their smartphones than their sunbeds this summer, according to a new survey. The global study of 9,200 travellers across 31 countries by Hotels.com Mobile Travel Tracker reveals that while away we turn into social media addicts, using mobile phones to search for our next meal and have Facebook Face-⁠Offs with travel companions. It seems being sun smart has paved the way for travellers to indulge in more phone time, as globe trekkers are now spending more time on their phones than in the sun. Instead of spending hours relaxing around the pool or exploring the sights and attractions of a new city, holiday makers spend 50% more time on their to smartphones than their sunbeds. The survey reveals we spend an average of two hours a day topping up our tan, compared to three hours a day using mobile devices. Shockingly, almost 10% of travellers will spend more than seven hours a day with a smartphone in their hands. 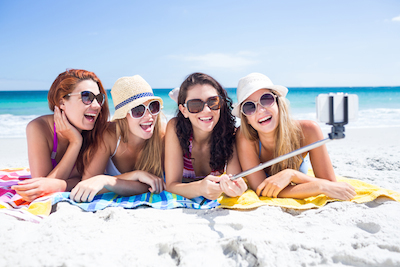 Globally, 40% of travellers use social media to gloat about their holidays but only 22.33% of Brits indulge in this self-⁠gratifying social media practice. While 27% of global respondents admitted to checking in to show off their holiday, only 13% of Brits admit to doing the same. Can we survive without our apps? Smartphone apps play a huge part in Brits’ annual holidays as they pose for pictures and message friends and loved ones back at home. More than one in 10 (12%) admit to only selecting a hotel if it offers free Wi-⁠Fi. The smartphone has become the ultimate travel companion with almost half (46%) of people globally using one to get around thanks to map apps, and a further 20% using them to translate words or phrases to communicate with the locals. Around the world, 14% of travellers have used their mobile device to check into their hotel and another 5% have even used their device as a room key. Checking the weather forecast in their destination is also popular for Brits abroad with almost a third (32%) using their mobile devices to find out if and when the sun will be shining.